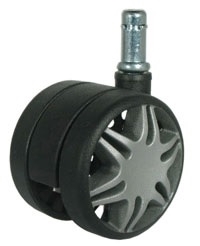 BuyCasters Mag Style Nylon Twin Wheel Office Chair Casters with Friction / Grip Ring mount, (7/16" Diameter X 7/8"). 60mm (2.36"). Flat Black with gray spokes. 125lb Capacity each. OEM replacement option for Furniture and Chair Casters. Most office chairs use five casters and wheels. *If using on hardwood floors, for floor protection try our polyurethane wheel caster. Overall Ride Height : 2-3/4"
Best on Carpet, Linoleum and Desk Mats.